Sean John is a Conservative thinker who is concerned about the way our great nation is headed and tackles some of these Issues with a fair and balanced opinion. 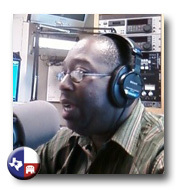 Sean John is the host of the Indy Radio Factor, which is a political talk radio show that discusses the issues that we as a nation are facing. He is also the editor of a blog called the Independent Political Thinker where he has deep discussions about the challenges we face as a nation. The Indy Radio Factor is based in Dallas, Texas. You can also follow Indy Radio Factor on Twitter.